Cut chicken in to bite-sized pieces and place in a slow cooker. Rinse and drain beans, add to slow cooker. Add all other ingredients except cream cheese and optional garnish ingredients. DO NOT drain corn or chilies. Simmer in slow cooker for 5 hours on low or 3 hours on high. Microwave cream cheese for 60 seconds to melt. Add to slow cooker and stir well. Serve with your favorite garnishes such as: shredded cheese, sour cream, chopped tomatoes, green onions, or tortilla chips. This time of year, my slow cooker has a permanent place on my countertop. There is nothing more wonderful than to come home on a cold day and smell a pot of something delicious simmering away, ready for my family to dive in and warm up! 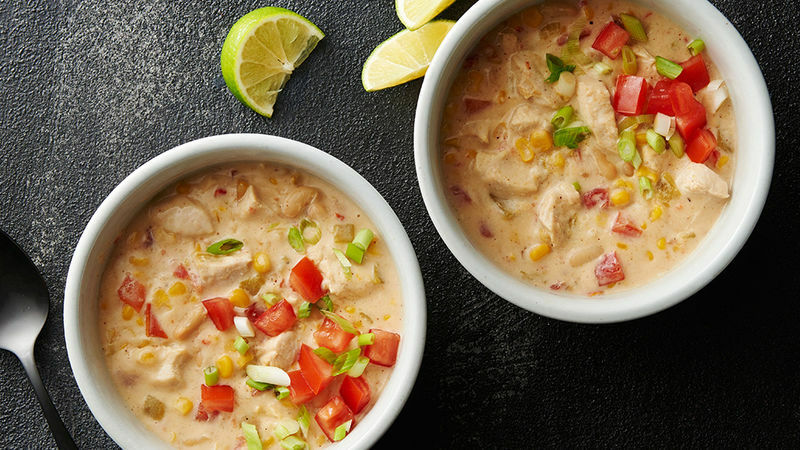 One family favorite is this White Chicken Chili. Traditional chili is always a wintertime favorite, but my kids’ very favorite is this creamy and not-too-spicy version. It smells AMAZING while cooking and everyone loves serving up a bowlful with their favorite fixin’s on top. The best part about this recipe is there is very little prep! You simply cut up your chicken, drain your beans, then throw all the other ingredients in your slow cooker! That gets bonus points from this busy mom!! For bonus points with the kids, serve your chili up with fun garnishes and ingredients so everyone can “customize” their bowl. But honestly, what I love most about this dish is that it literally takes me 5 minutes to prep and throw in the slow cooker. And, I always get rave reviews from the fam! I always make sure to cook a big batch to freeze in gallon Ziploc bags for other quick weeknight meals.